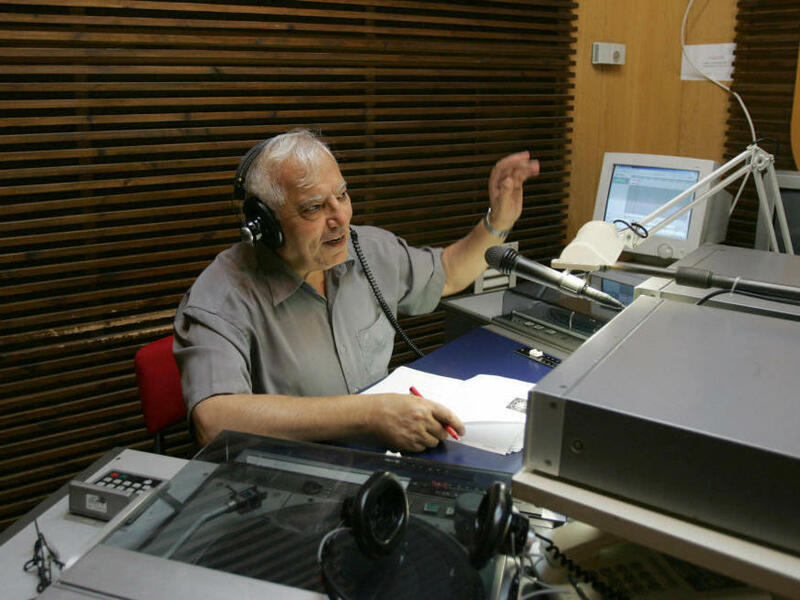 Iranian-born Menashe Amir (shown here in 2006) hosts a call-in show on Israel Radio's Farsi service, one of the few forums for direct discourse between Iranians and Israelis. Iranian Jews attend a Shabbat service at the Pol-e-Choubi Synagogue in Tehran on April 23. Iran has the largest Jewish population in the Middle East outside Israel. 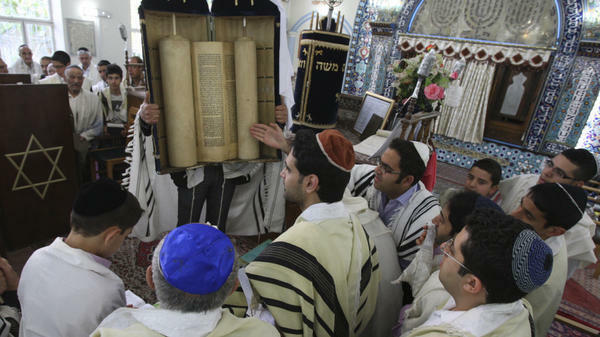 Growing conflict between the two countries is affecting Iranian Jews in both places. As tensions between Israel and Iran ratchet up, one community is caught in the middle: Iranian Jews living in Israel. Many of them maintain strong ties with their homeland, and with the possibility of war looming, they're uniquely conflicted. In a small, cluttered apartment in Jerusalem, Naheet Yacoubi cooks a traditional Persian meal for her Shabbat dinner. Originally from Tehran, she moved to Israel when she was a child. It's easy to find Persian ingredients here, she says. Some 250,000 people of Persian descent live in Israel, and that migration continues. But Iran still has the second-largest community of Jews in the Middle East, and the two communities are close, says Aaron Yacoubi, Naheet's husband. "We can call them directly, and they can call us," he says, noting that family members can come and visit. Iranian Jews travel to Israel via Turkey, with special documents from the Israeli Embassy there that let them enter the country undetected by Iranian authorities. Aaron says his cousin visited from Tehran just two months ago. Unfortunately, he says, he can't travel to Iran because he only has an Israeli passport. Aaron says he is proud of his Persian ancestry, yet he's also loyal to the Jewish state. But lately, he says, because of the tension with Iran, he feels conflicted about what could happen next. There are fears that Israel could strike at Iran's nuclear facilities. Israel says Tehran wants to develop nuclear weapons; Iran maintains that its nuclear program has only civilian uses. There have been four rounds of U.N. sanctions against Iran, as well as harsher measures taken by the U.S. and the European Union. Aaron says it's all taking its toll. He says he feels terrible for people in Iran, where life is getting difficult. On a recent day, he calls his cousins in Iran to see how they are. Speaking in Farsi, his relatives there tell him that they want to sell their house but can't, the currency is devaluing and it's a struggle to make ends meet. Tears rolls down Aaron's face as he hears their news. After he hangs up, Aaron says he doesn't think it's right to hurt the people in Iran. He says something should be done to hurt the Iranian government instead. Those mixed feelings are pervasive among the Iranian Jewish community here. Meir Javedanfar is an Iran analyst of Iranian descent who lives in Tel Aviv and has written extensively on Iran-Israel relations. "It's not easy not to get emotional when talking about Iran and Israel, especially for people like me who've lived in Iran and in Israel," Javedanfar says. "The Iranian people don't want another war. They are a great people and they want to live in peace. It's just their leadership that is aggressive, not them," Javedanfar says. "And it hurts me to see how [the] people of Israel are being threatened by a regime which has called their country a virus, a cancer. I don't want to see them get hurt, either, so it's a very difficult ... scenario for Iranians." With the possibility of war looming, one of the few forums for direct discourse between Iranians and Israelis is a call-in show hosted every Sunday on Israel Radio's Farsi service. "There is no other way, no other media for Israel to bring its message to the Iranian people," says Menashe Amir, who hosts the program. He says there are about a dozen calls from Iran during each show covering a range of topics. The callers aren't allowed to give their names in case of reprisals in Iran. Amir, who was born in Iran, says most people talk about how hard daily life is under sanctions. He says the threat of war is also a hot issue. "Of course most of the Iranians are concerned. ... They demand Israel not to attack civilian targets, not to destroy the Iranian infrastructure, not to harm the economy of the country," Amir says, though he adds that a strike on military targets might be acceptable to some there. Amir says everyone in his community is watching events unfold. "The actual situation is so fluid, it's like chess — once you move one of the pieces, the whole picture changes," he says. "We are all waiting," he says, adding that no one knows what will happen next. Let's talk next about Iran. This week, President Obama used his authority to tighten sanctions on Iran's central bank. The U.S. is pressuring Iran over its nuclear program. News reports have repeatedly floated the notion that Israel is preparing a military strike against Iran. Israeli officials have said, at times, that a strike is not imminent, but they've never taken it off the table. INSKEEP: Amid the tension, one community is caught in the middle. Many Iranian Jews now live in Israel. LOURDES GARCIA-NAVARRO, BYLINE: In a small, cluttered apartment in Jerusalem, Naheet Yacoubi cooks a traditional Persian meal for her Shabbat dinner. GARCIA-NAVARRO: Originally from Tehran, she came to Israel when she was a child. It's easy to find Persian ingredients here she says. There are some 250,000 people of Persian descent living in Israel, and that migration continues. But Iran still has the second largest community of Jews in the Middle East. And the two communities are close, says Aaron Yacoubi, Naheet's husband. GARCIA-NAVARRO: We can call them directly and they can call us. In fact we have family members who come and visit here, he says. Iranian Jews travel to Israel via Turkey. The Israeli embassy there gives them special documents to be able to enter the country undetected by the Iranian authorities. Aaron says his cousin came from Tehran just two months ago. Unfortunately he says, we can't travel to Iran though, as we only have Israeli passports. Aaron says he is proud of his Persian ancestry, yet he's also loyal to the Jewish state. But he says lately because of the tension with Iran he feels conflicted over what could happen next. There are fears that Israel could strike at Iran's nuclear facilities. Israel says Tehran wants to develop nuclear weapons. Iran maintains its nuclear program has only civilian uses. There have been four rounds of U.N. sanctions against Iran as well as harsher measures taken by the U.S. and the European Union. Aaron says it's all taking its toll. GARCIA-NAVARRO: I feel terrible for the people there, life is getting difficult, he says. GARCIA-NAVARRO: He calls his cousins in Iran to see how they are. Speaking in Farsi, his relatives there tell him that they want to sell their house but can't. The currency is devaluing, and it's a struggle to make ends meet. Tears rolls down Aaron's face as he hears their news. GARCIA-NAVARRO: I feel that it's not right to hurt the people, he says. I feel they should do something to hurt the government instead, he says, after he hangs up. Mixed feelings are pervasive among the community here. MEIR JAVADANFAR: I mean it's not easy not to get emotional when talking about Iran and Israel, especially for people like me who've lived in Iran and in Israel. GARCIA-NAVARRO: Meir Javadanfar is an Iran analyst of Iranian descent who lives in Tel Aviv. He's written extensively on relations between the two countries. JAVADANFAR: The Iranian people don't want another war. They are great people, and they want to live in peace. It's just their leadership that is aggressive, not them. And it hurts me to see how people of Israel are being threatened by a regime which has called their country a virus, a cancer. I don't want to see them get hurt either, so it's a very difficult sort of scenario for Iranians. GARCIA-NAVARRO: With the possibility of war looming, one of the few forums for direct discourse between Iranians and Israelis is a call-in show hosted every Sunday on Israel Radio's Farsi Service. MENACHE AMIR: There is no other way, no other media for Israel to bring its message to the Iranian people. GARCIA-NAVARRO: That's Menache Amir who hosts the program. He says there are about a dozen calls from Iran during each show to talk on a range of topics. The callers aren't allowed to give their names in case of reprisals in Iran. Amir says most people talk about how hard daily life is under sanctions. He says the threat of war is also a hot issue. AMIR: Of course most of the Iranians are concerned about this idea. They demand Israel not to attack civilian targets, not to destroy the Iranian infrastructure, not to harm the economy of the country. GARCIA-NAVARRO: Though he says a strike on military targets might be acceptable to some there, Amir says that everyone in his community here is watching events unfold. AMIR: The actually situation is so fluid, it's like a chess; once you move one of the pieces, the whole picture changes. GARCIA-NAVARRO: We're all waiting, he says. No one knows what will happen next.